I managed to get sick. Came home Thursday with headache and sore throat, slept for 3 hours, woke up, ate, and went straight to bed again. Yesterday I was still sick … let me tell you: it’s no fun at all. The only good thing about being sick is that I can spend most of the day knitting, and since I haven’t been very productive for past couple of days I got back to my sock. 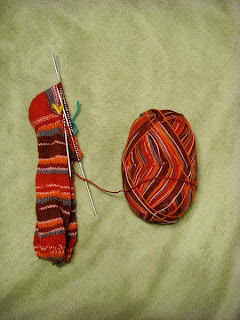 The long-promised worse started as soon as I hit the heel. W&T??? I thought I conquered all of the abbreviations. 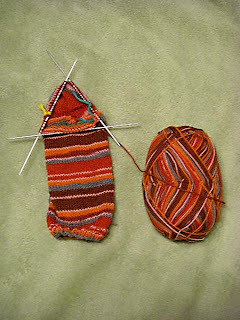 I managed to wrap and turn, and slip, and knit but the heel did not look good. So I finally gave up and undid it (what is the proper term for it?). Yes, for the first time in my 3 months knitting/crocheting career I undid part of my creation. The explanation came from INTERNET!!! By the way, do you ever wonder how people would get all the information in pre-Internet times? I understand that books in the library are very informative, but when you are sick with a fever at 1AM going to the library is out of the question. Back to the sock, I first found this amazing lady with enchanting British accent who was explaining how to do the heel of a sock. The only problem was that she knitted using British method (duh!) and I had really hard time "translating" it to the continental one. Do not forget I am sick with a fever!!! After going through more youtube videos I found this wonderful, wonderful lady with clear and coherent instructions on sock knitting. I love the way she compares stitches to girls with different hair colors and pearl necklaces. I also love her step-by-step instructions and would looove to attend one of her workshops. Yes, Cat Bordhi is my new role model! And just to show off my progress, remember the little guy? Well he grew quite a bit in last 2 days. I even predict that I will be starting his younger brother tomorrow.